This briefing was held to stimulate additional support for President Obama’s Precision Medicine Initiative, which has been attracting significant bipartisan backing since its announcement earlier this year. The briefing also highlighted the excitement and promise in science and medicine that has been building over the past few decades, despite an overall reduction in federal funding earmarked for the National Institutes of Health (NIH) and the National Cancer Institute (NCI). 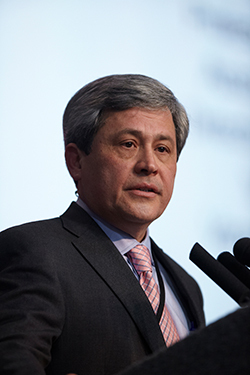 Carlos L. Arteaga, MD, immediate past-president of the AACR, moderated the special briefing on precision medicine today in Washington, DC. An underlying theme of this special briefing, which featured Elizabeth H. Blackburn, PhD, 2009 Nobel Prize in Physiology and Medicine recipient, and Jo Handelsman, PhD, associate director of science for the White House Office of Science and Technology Policy, was the economic ramifications of failing to support cancer and biomedical research. Speakers commented that biomedical research discoveries and technologies directly correlate with increased jobs and significant boosts to the country’s economy. Handelsman also spoke in detail about the president’s Precision Medicine Initiative, highlighting how precision medicine will markedly improve patient care and how we have just begun to understand and harness the power of precision medicine. Increased governmental funding of cancer prevention efforts was also highlighted as a crucial area in need of support. It was stressed that by both promoting cancer interception and supporting the creation of more precise cancer screening and detection technologies, many cancers will be detected earlier and in turn be able to be treated more effectively, corresponding with a lower overall burden to the nation’s health care system. 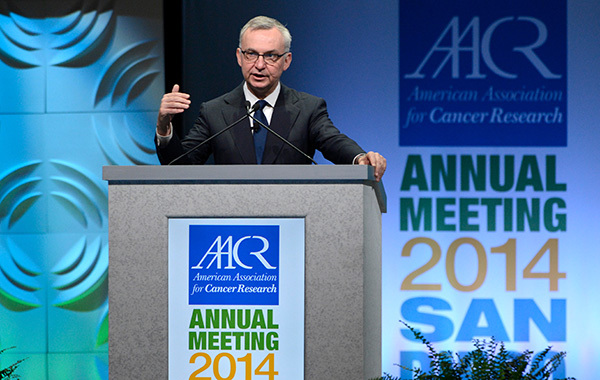 The AACR’s leadership was prominent at the briefing with both President José Baselga, MD, PhD, and immediate Past-president Carlos L. Arteaga, MD, present to discuss the current state of translational cancer research. Baselga and Arteaga outlined not only the challenges and opportunities that exist in this arena, but also sought to fully explain the notion of “precision medicine.” In their remarks, added emphasis was placed on the current concern regarding the loss of the next generation of cancer researchers. They both stressed that unless there is a concerted effort by the government to support cancer research, the best and brightest young scientists will continue to leave the field for alternative careers, resulting in a dramatic decrease in new cancer therapies. AACR President José Baselga, MD, PhD, seen here during the AACR Annual Meeting 2014, was among the cancer experts who spoke at today’s special briefing on precision medicine. Importantly, this briefing brought together stakeholders from across the cancer research enterprise. In an effort to capture the “bench to bedside” nature of cancer research, Harvard’s Joan S. Brugge, PhD, spoke about the great strides being made in basic cancer research that are fueling an ever-growing number of translational and clinical cancer research efforts devoted to designing and developing molecular targeted therapeutics to treat various cancers. Eric H. Rubin, MD, from Merck Research Laboratories spoke of his personal experiences in leading the development of the FDA-approved immunotherapeutic, pembrolizumab (anti-PD-1 monoclonal antibody), for treating metastatic melanoma. He also outlined how precision medicine is creating enormous excitement in the pharmaceutical industry as new research in the fields of immunology, epigenetics, and genomics, among others, are driving countless efforts to create novel therapeutics capable of targeted key cell signaling molecules and pathways commonly disrupted in cancer. At the briefing, the AACR announced that this style of briefing will become a key annual initiative of the Fellows of the AACR Academy. The goal of this briefing series will be to establish an active and ongoing dialogue between the scientific brain trust of AACR Academy fellows and members of Congress.